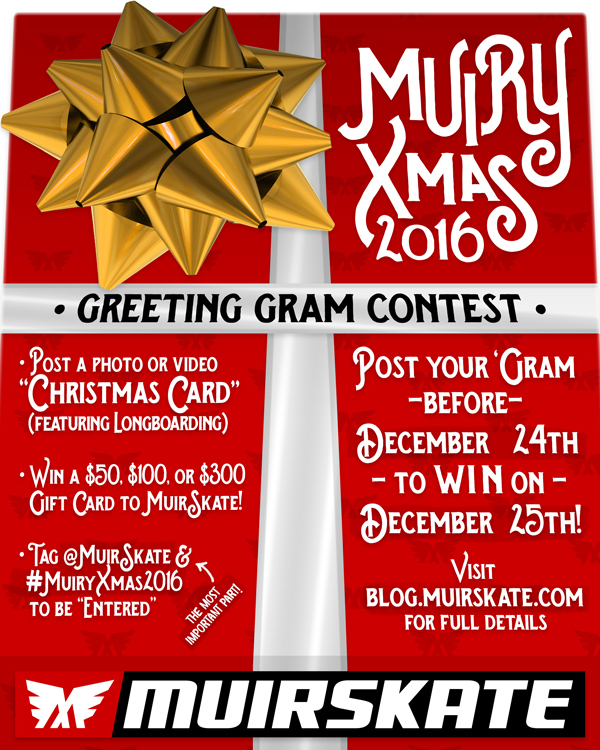 Longboarding Blog: MuiryXmas2016 — Christmas Greeting Gram Contest! MuiryXmas2016 — Christmas Greeting Gram Contest! Here's your chance to guarantee that you get the gear you want this Christmas! You can win a $50, $100, or even a $300 gift card to MuirSkate.com! Share a "Christmas Greeting 'Gram" on Instagram featuring longboarding to join in! Be sure to tag us (@MuirSkate) and #MuiryXmas2016 to be "officially" entered* into the contest. If you have any questions, please ask away! Reply to this post or hit us up on Instagram! *Your feed/posts will need to be public in order for us to see your 'Gram.